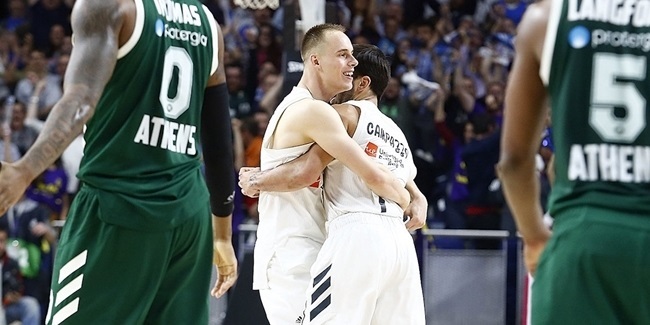 A pair of dominant performances by big men on the road earned co-MVP honors for Round 2 of the Turkish Airlines EuroLeague Regular Season for Olympiacos Piraeus center Nikola Milutinov and Real Madrid forward Anthony Randolph. Milutinov led the Reds to an 80-85 road win at KIROLBET Baskonia Vitoria-Gasteiz with career-highs of 23 points and a performance index rating of 33. He made 9 of 13 two-pointers and 5 of 6 free throws to go with 11 rebounds and 2 steals. Randolph produced 25 and 11 boards as Los Blancos took out AX Armani Exchange Olimpia Milan 85-91 in comeback fashion. Randolph made 5 of 8 two-point shots and 3 of 4 three-pointers to match Milutinov with a 33 index rating. Both edged CSKA Moscow star Nando De Colo and Madrid playmaker Facu Campazzo, who had PIRs of 32 each in Round 2. 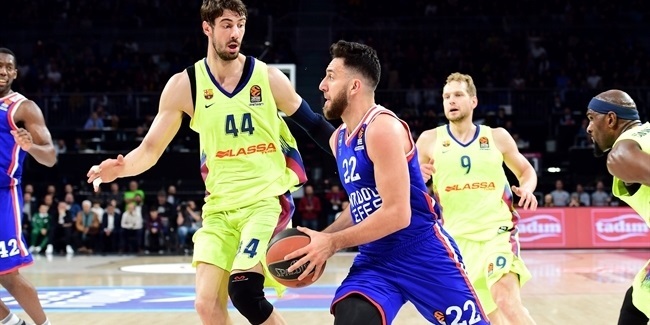 De Colo produced 27 points, 5 assists and 4 steals in an 86-89 victory over Maccabi FOX in Tel Aviv, while Campazzo tallied 21 points and 7 assists for Madrid. Rounding out the list of top performers in Round 2 was Maccabi forward Anthony Caloiaro, whose PIR of 27 came from 21 points, 4 rebounds and 3 assists in an 86-89 home loss to CSKA. No player in Round 2 outscored former Alphonso Ford Trophy winner De Colo and his 27 points. Reigning Ford Trophy winner Alexey Shved of Khimki Moscow Region came close though, with 26, and leads the league with an average of 30 points per game. Milan forward Jeff Brooks and Jeremy Evans of Darussafaka Tekfen Istanbul were the best rebounders in Round 2, with 12 apiece. Milutinov is the only player averaging double digits in rebounding after two rounds, with 10.0 per game. 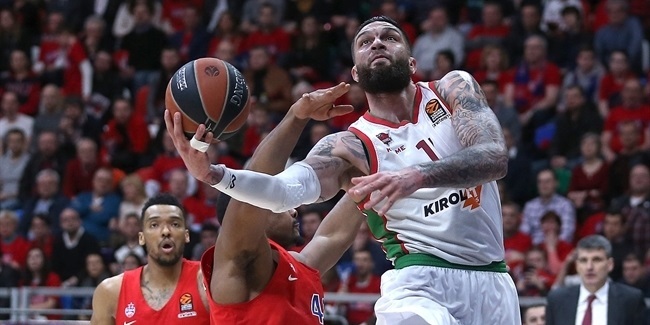 Veterans Nick Calathes of Panathinaikos OPAP Athens, Vassilis Spanoulis of Olympiacos and Shved share the weekly lead with 8 assists each; Calathes's average of 11.0 is tops in the league. Shved's backcourt mate Dee Bost swiped 6 steals, matching the most in any game this season or last. Stefan Jovic of FC Bayern Munich is averaging a league-best 4.5 steals per game. Panathinaikos's Stephane Lasme and Madrid's Edy Tavares blocked 3 shots in Round 2 and both average 2.5 blocks this season. They are tied for the league lead. Three players collected double-doubles in Round 2: Will Clyburn (11 points, 10 rebounds) of CSKA and the round's co-MVPs, Milutinov and Randolph.